So you’ve finally finished all your meetings, answered all your phone messages, helped the line of people outside your office, and wrangled your inbox under control. Now you can focus on some actual work. Except, your friend just shared a new meme on Facebook. Instagram and Snapchat pinged a few updates so it wouldn’t hurt to just take a quick peek. And maybe you should check and see if you can still reach that Pokestop from your office. Hours later you haven’t done any work but you have read a bunch of interesting Wikipedia articles. Let’s investigate ways you can avoid distractions. The first line of defense is self-control. That works most of the time. If your day is like mine there’s too much to do. I’ve used the Pomodoro Technique in the past to help break up larger tasks while keeping up with ongoing smaller tasks—e.g., email—and at the same time providing time for breaks. The technique’s name is derived from a tomato-shaped kitchen timer the developer used when he came up with the idea. It works like this: you set the timer for 25 minutes and work; take at least a five-minute break when the timer goes off; after four cycles of this take a longer break. This is a great way to train your brain to focus on tasks and keep deadlines. 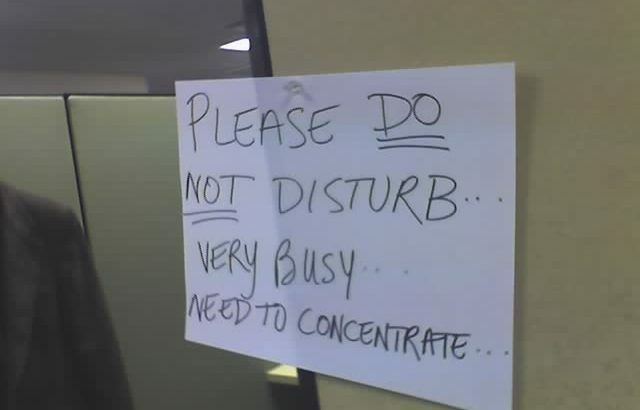 Occasionally you need a little support in avoiding distractions. There are three browser extensions—one each for Firefox, Chrome, and Safari; sorry IE—that all do essentially the same thing: they let you block websites either completely or after a certain amount of time has elapsed. I used LeechBlock for Firefox to great success in the past. For example, I created a group called ‘social media’ and put in URLs for Facebook, Twitter, Instagram, Reddit, and Youtube and then configured the extension to allow me fifteen minutes of access to those websites every four hours. If I used up my time those sites became blocked. There are more options including which days or time of day the block comes into effect, whitelisting sites that are allowed, and so on. If you’re a Chrome user, StayFocusd is an extension that does essentially the same thing as LeechBlock. WasteNoTime is available for both Chrome and Safari. All three of these extensions are great ways to avoid the siren call of the Internet when you need to focus. Need something more serious that you can run across devices and platforms? Freedom is a piece of software that does the same thing the three extensions do but it will run on all your computers and devices. It can also be set up to block the entire Internet, including email, which is great if you really need to focus. The one drawback to Freedom is that it’s not free. Prices run from $6.99 for a single month of access, $2.42/month for a year of access, or $119.99 for access to Freedom forever. They often run sales at up to 50% off the price of the forever option. Freedom might be a better option for personal use but it’s something you can look into for work, too. Of course, you could accomplish the same thing by turning off your WiFi/Internet but Freedom lets you automate turning things off and on. I’ve used Freedom at home for writing projects when I don’t want anything to disturb me. Finally, if you keep circumventing the extensions by turning them off and the price of Freedom is too high, you can modify your computer’s hosts file. The hosts file predates TCP/IP and DNS and was used to map hostnames to IP addresses. When I worked as a computer programmer we used the hosts file to connect to our clients’ servers. To block a site, you would set the hostname to the IP address of 127.0.0.1 (the localhost). When you try to go to the website you added to the hosts file your computer tries to find it on your computer and fails. That is, assuming your computer doesn’t actually host the website. Obviously this last option is extreme and should be used with caution. The hosts file is a common target for computer viruses as it effects how the machine works with regards to the Internet. This is an instance where I’d recommend disconnecting from the Internet before modifying the hosts file but there could be reasons to use this option. What are some things you’ve tried to avoid distractions? General information Distractions, Productivity, Software. permalink.